Farrier’s Formula® Double Strength Plus Joint is a pelleted combination hoof and joint supplement that can be added as a top dressing on the regular feed or given separately. The product is formulated to promote dense hoof wall growth along with additional joint and tendon support. Over 30 years of research, clinical trials, and field testing have validated the effectiveness of Farrier’s Formula®. The same research databases utilized to formulate Farrier's Formula® have now been incorporated into the development of Farrier’s Formula® Double Strength Plus Joint. By providing the same nutrients in the same levels, hoof growth and quality is equally effective as Farrier’s Formula®, but with the additional benefit of supplemental nutrients for joint health. Painful joints that are associated with arthritis, degenerative joint disease, weak ligaments or injury not only affect the ability and willingness of the horse to perform, but also leads to daily discomfort and increased risk of further injury. Weak hoof structure and hoof wall problems such as quarter cracks, toe cracks, sand cracks, brittle hoof walls and hoof wall separation not only predispose the horse to further hoof wall deterioration and lameness, but also creates an environment ideal for the microbial invasions associated with white line disease and crumbling horn. 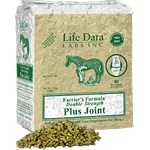 Farrier’s Formula® Double Strength Plus Joint strengthens the connective tissues of the joints, tendons and ligaments and also contains nutrients to promote lubrication of the joints. Farrier’s Formula® Double Strength Plus Joint provides nutrients important for strong hooves, skin and joints in the correct balance and ratio. It also promotes strong and fast growth of the hoof wall, sole, frog, and heel. It provides proper nutrition to “grow out” wall cracks, strengthen and thicken the hoof wall and sole, reduce the likelihood of microbial invasions and bruising, and assist with laminitis recovery. The inclusion of proline, ornithine, glucosamine and manganese provide targeted joint support. This product contains the sulfur needed for joint health in the form of the amino acids methionine and cysteine. Farrier’s Formula® Double Strength Plus Joint eliminates the concern of excessive sulfur supplementation that usually occurs when feeding hoof and joint supplements separately. The level of sulfur provided in the recommended feeding level for an average 1,000 pound horse is equivalent to 3,500 mg of MSM. •	Supplies nutrients to strengthen connective tissue along with additional joint, ligament and tendon support. •	Combines hoof and joint supplements into one supplement to prevent the over supplementation that often occurs when feeding separate hoof and joint supplements. •	Reduces daily feeding expense. •	Suitable for all ages and work levels. 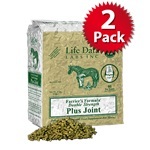 Farrier's Formula® Double Strength Plus Joint is available in 11 lb. nitrogen flushed vacuum bags - a 60 day supply for the average 1000 lb. horse. Farrier’s Formula® Double Strength Plus Joint is doping free and can be fed to competition horses.